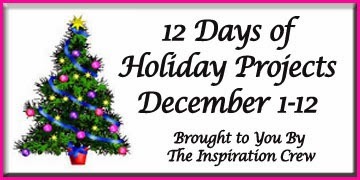 Welcome to Day 10 of the 12 Days of Holiday Inspiration Blog Event brought to you by "The Inspiration Crew". We’re just a group of online crafty friends who love being creative. This time we're doing a 12-day event to provide you with tons of Holiday Inspiration. Today I have yet another super easy idea to use up some of your stash. I've had some felt around for ages. I always imagine I'll sew some cute little ornaments, but that hasn't happened yet. 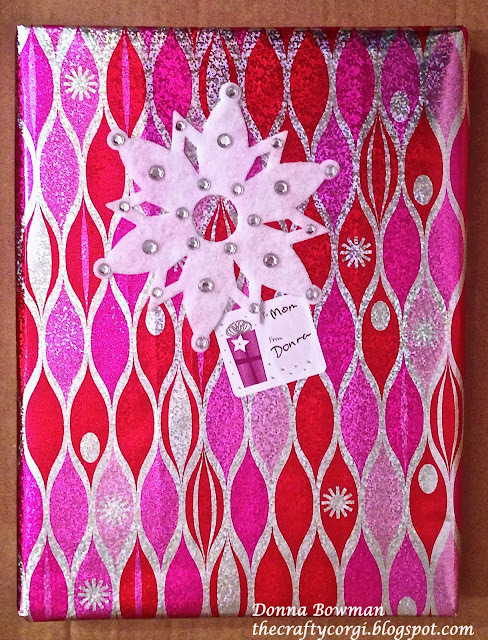 Then, when I was in Hallmark last week I saw a present decoration that was a felt snowflake covered in rhinestones and of course I thought, I can do that for free! So I just ran a white piece of felt through my Big Shot using a big Sizzix Snowflake Die. I was unsure how it would work in the Big Shot, but I was happily surprised to see it cut the felt perfectly!! Then, I just added some sticky back rhinestones and after a week, none have fallen off yet. I decided to use it on this present for my mom instead of a bow. It would also look great hanging from a bag. And, it can be used as an ornament after the present is open. So easy, fun and quick! Very pretty! I haven't tried cutting felt yet with my dies, but I love the look! This is beautiful - love the colors and the shine. SO fabulous Donna! Love the bright coloors and the felt diecut! Made me laugh when you said you "always imagine I'll sew some cute little ornaments". Every crafter has a project idea that just never makes it from the brain to the hands. Your adornment turned out beautifully! oh my this is absolutely perfect.. I love that snowflake.. I love this card the bright foil is awesome! Very pretty way to decorate a present. I need to try felt in my Big Kick. Wow! I would take this gorgeous snowflake over a bow any day!!! Clever idea - felt through the Big Shot....who'da thunk it? Totally creative and another great tip as using up 'the stash'. L0VE the wrapping paper!!!!!! Wow, that paper is gorgeous! It has oomph because of the foil look and those bright colors. Your mom will love the snowflake, too!